I found a version of this demonstration online a couple of years ago. I admit, when I first tried it with my class it was mostly for a crowd pleaser to demonstrate the activity series of metals, but I then became very intrigued by the processes occurring. The original source only referenced the “single replacement reaction” between Mg(s) and AgNO3(aq). Therefore, when I saw a grayish product (silver) I was not surprised. However, I was surprised by the white flash and the production of a white product, which were reminiscent of the classic combustion of magnesium demonstration. This led to some research and my conclusions that follow. I should note that the quotation marks above (around single replacement reaction) are due to my utter loathing of the terms single displacement/replacement (instead of oxidation-reduction) and double displacement/replacement (instead of precipitation and acid-base) as they are usually presented. I omit both from my teaching, but that is the topic of another piece. I pull out a bottle of powdered Mg(s) and a bottle of powdered AgNO3(s). I do not point out that the solid AgNO3 is not the aqueous solution mentioned earlier. I have students put on goggles and wait with baited breath as I read the hazards on each bottle before carefully mixing the two powders. As I slowly and meticulously mix the two reagents, I behave as though they could react at any time. A collective sigh and feeling of confusion surface when nothing occurs. After all, doesn’t the reaction they wrote occur? Have they been deceived by their instructor? I pose the question as to why the powders have not reacted. 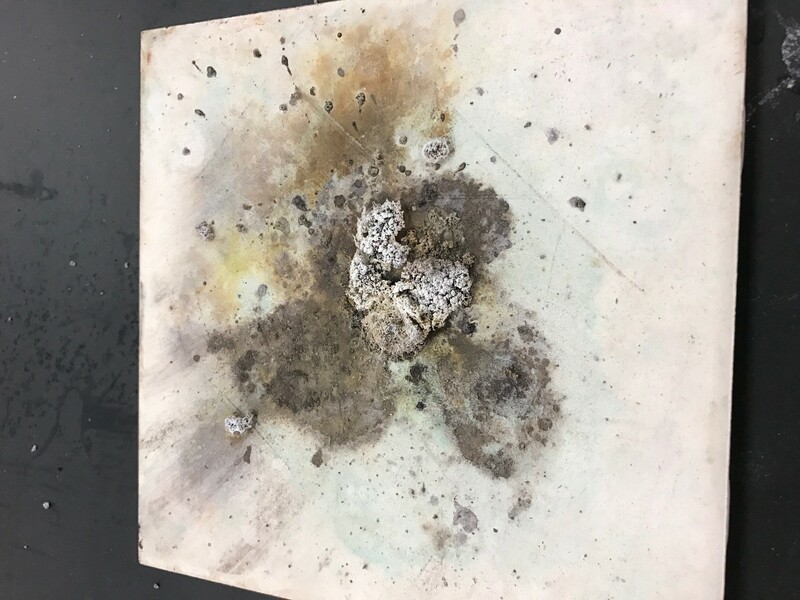 Perhaps someone will note that the silver nitrate is not a solution as mentioned in the statement for which they wrote a reaction, but so far no student has ever come to that conclusion at this stage of the demonstration. I then instruct a student to turn off the lights. This gets all of them excited. I deposit the uniform mixture of powders on the middle of a ceramic tile and carry it over to the fume hood. The students only now notice that the fume hood is already on. Inside the fume hood is a buret filled with water that is dripping 1 drop every 5 seconds or so, clandestinely set up while they were working on writing the reactions. I point out to them that the buret is filled with water. Immediately after a drop falls, I quickly place the ceramic tile containing the mixture beneath the buret and close the hood as I step away. The next drop of water falls on to the mixture. 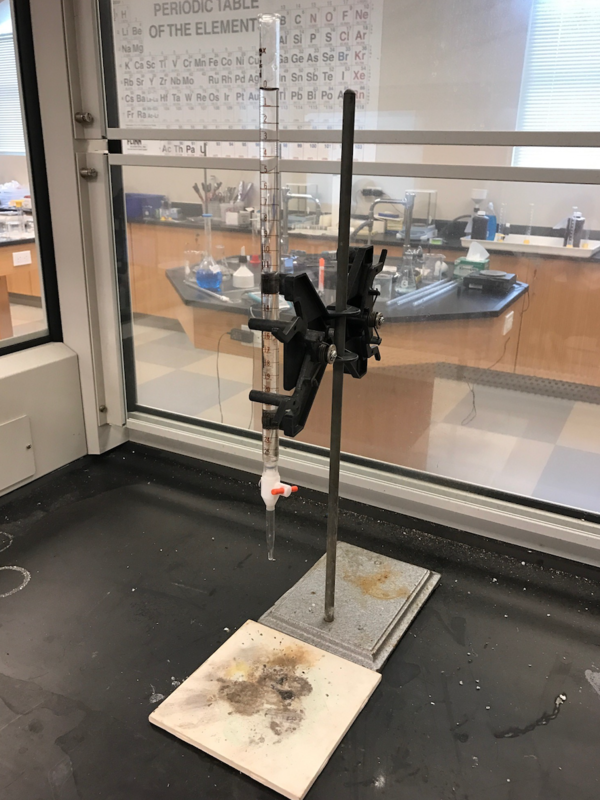 A brown gas rises from the powder and curiously wisps above the mixture before the entire fume hood is suddenly and completely engulfed in a bright flash of light that lasts but a moment. Some students scream, other students laugh, all are awestruck. The demonstration can be performed at various points of the year depending on your sequence and desired level of complexity. I present it during my first-year course following study of different classifications of chemical reactions and endothermic/exothermic processes. The advanced thermodynamic data are included below to show that it can also be a useful demonstration in an advanced, AP, or IB course as well. Watch the slow motion video of the demonstration below. Schrempp, Chris. Bangs, Flashes, and Explosions: An Illustrated Collection of Extraordinary, Unusual, and Thrilling Chemistry Demonstrations and Activities. 2nd edition. ExploScience Publications. Alta Lorna, CA: 2007. 30 minutes including preparation time. Download the teacher document found in "supporting information" below the post to find the background information. 1. Fill the buret with distilled water. Fix the buret to the retort stand in a fume hood using a buret clamp. Make sure the fume hood is turned on. 2. 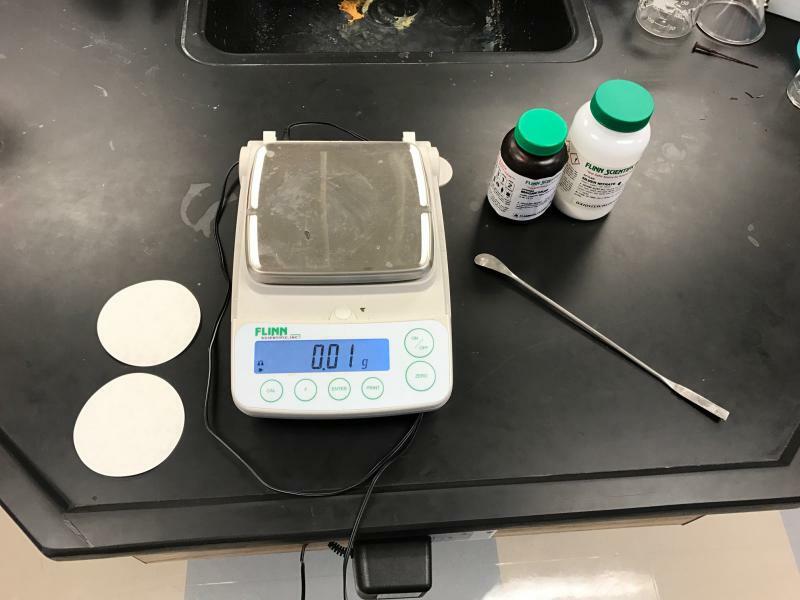 Measure out 0.50 g of Mg powder and 1.30 g of AgNO3 powder. Create an even mixture by pouring the two powders back and forth between two pieces of weighing paper or filter paper. 3. This should be done immediately before the demonstration. Do not grind the powders once mixed. 4. Deposit the mixture on the center of a ceramic tile. 5. Adjust the stopcock on the buret until 1 drop of water is released every 5-10 seconds. 6. Have a student turn off the lights in the room. 7. Immediately after a drop of water falls, place the mixture under the buret so the next drop will land on the mixture. Close the fume hood and step back quickly. Do not scale up the demonstration. Mg power is a serious fire hazard. Silver nitrate is a strong oxidizer and a skin and respiratory hazard. The reaction produces a bright white flash so you may want to instruct observers not to look directly at the reaction mixture. One of the products of the reaction is NO2(g) that is a noxious and toxic brown gas. Silver metal is the only metallic product of the reaction and is formed in very small quantities, most of which will oxidize. However, you can separate it from the other products by dissolving them in water to recover the silver produced if you wish. The solid products of the reaction are in small quantities and pose no safety hazard. They should be disposed of in the trash via Flinn Disposal Method #26a. 1. Schrempp, Chris. Bangs, Flashes, and Explosions: An Illustrated Collection of Extraordinary, Unusual, and Thrilling Chemistry Demonstrations and Activities. 2nd edition. ExploScience Publications. Alta Lorna, CA: 2007. I cannot find a working URL for this E-Book. Schrempp himself cites the book Classic Chemistry Demonstrations by T. Litster published by the Royal Society of Chemistry in 1995, however I do not have a copy of this reference to know what is included. Chemistry: The Central Science, 12th ed. AP Edition. Brown, Theodore; Lemay, Eugene; Bursten, Bruce; Murphy, Catherine; and Patrick Woodward. Pearson, Prentice Hall: New York, 2012.